A major resource for Early Childhood Music by Wendy H. Valerio, Alison M. Reynolds, Beth M. Bolson, Cynthia C. Taggart and Edwin E. Gordon. 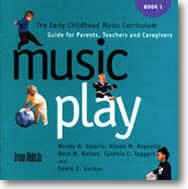 A complete full-color book and CD resource for early childhood music classes. Music Play is designed to assist teachers, parents, and caregivers of newborn and young children in the development of basic music skills such as singing, rhythm chanting, and moving. you will learn how to provide a rich music environment for them, how to listen to and understand the sounds they make, and how to reinforce each child's music and movement creativity through imitation and improvisation using audiation. The Music Play Guide includes 57 songs and rhythm chants in a variety of tonalities and meters and over 200 music and movement activities designed to assist you in dequential music and movement experiences for newborn and young children. Each of the songs and rhythm chants found in the guide is recorded on the accompanying CD. Includes notation and lesson plans adapted to the individual needs of each child, as well as a complete introduction to how young children learn when they learn music.